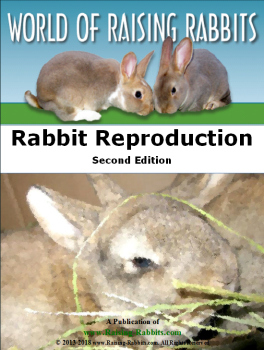 Our 87-page e-book covers all aspects of rabbit reproduction from mating, to pregnancy, kindling, care of the rabbit kits, weaning, sexing, and rebreeding. 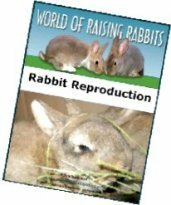 Now you can avoid the common problems with raising rabbits, and learn all the interventions you can employ to avert disaster with bucks, does, and kits. Rabbit reproduction has been revised and updated! As easily as rabbits seem to multiply, there are a surprising number of glitches in the process of raising litters of rabbits. The Raising-Rabbits website has already provided absolutely free the basics of rabbit mating, kindling, litter care and weaning. But while websites are great for this, one can only say so much per topic on a website. Sometimes breeders and owners need more info. That is why we created Rabbit Reproduction, a World of Raising Rabbits e-book that guides you through every detail of the entire process of mating rabbits and raising the babies from conception to weaning. Who needs an e-book on Rabbit Reproduction? This e-book is for every rabbit owner who hopes to have ONE or more litters of bunnies so they can avoid disasters in their rabbit litters. 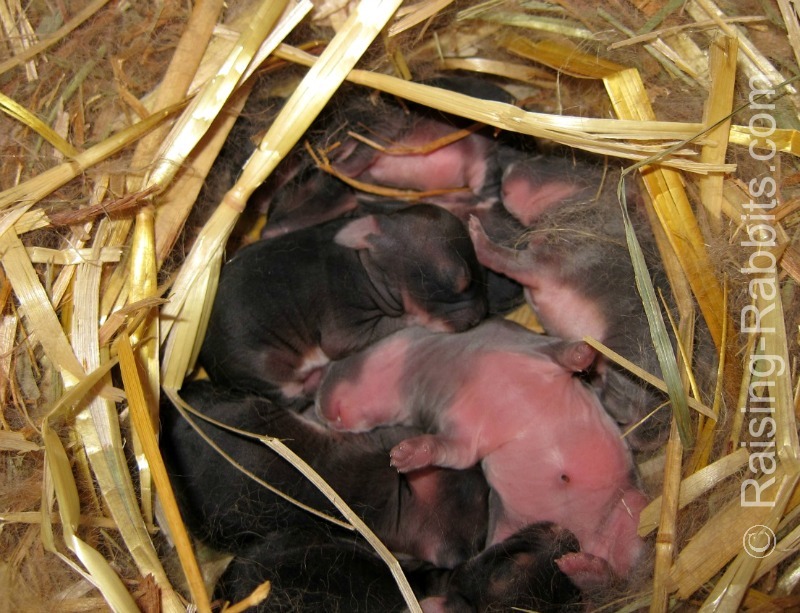 What do you do if one day you discover a pile of fur in your rabbit's hutch filled with tiny baby bunnies? It's clearly too late now. We'll help you deal with the emergency - see page 57. But you'll learn so much more! for all rabbit raisers, including the new ones! You've got this really nice doe and a totally amazing champion buck! But do you think you can get the two to mate???? I know, right?! You'll find three pages dedicated to all the tricks I use to convince the doe to accept the buck, starting on page 8. See the brown kit? It and the black otter next to it are foster bunnies. Fostering is discussed on page 64. It's very frustrating when you breed a rabbit, she builds an amazing nest, and then doesn't have any babies! I'll explain what is happening with the doe on pages 23 and 24. First time mothers – are they all stupid?? Is it possible to reawaken a doe's instincts if she initially ignores her newborn kits? Did you know that the doe and buck might re-mate soon after the doe delivers her babies? Check pages 13-14, and pages 56-57. 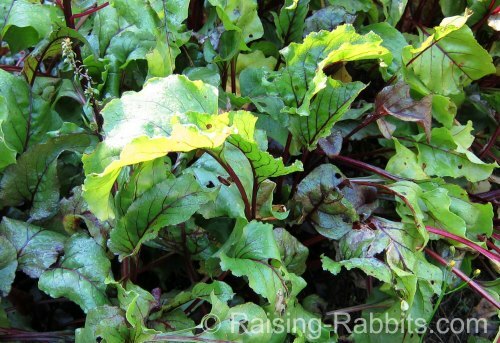 We'll start with all the normal bunny care the rabbit owner should give to their kits from birth through weaning. What a helpless feeling when one by one, the kits get skinny and then start to die. No more worries - there's a simple dietary answer that quickly results in excellent milk production. See page 58. One of the biggest controversies amongst rabbit owners and breeders is how to best wean bunnies. If the weaning is not done carefully, the risk for a deadly diarrhea rises. I'll tell you exactly how bunnies are weaned at Aurora Rex Rabbit Ranch, starting at page 72. And as far as I know, we've never lost a bunny to diarrhea at weaning. Another controversy centers around how one should feed bunnies. The risk is the same - if you don't feed them correctly, they might get diarrhea because of their immature digestive tract flora, and possibly die. But, there's an EASY RULE to follow that will put your mind at rest and simplify your life. Find the solution and a full explanation starting on page 69. Rabbit Reproduction contains 87 pages of valuable information in full color, useful to all rabbit breeders and rabbit owners. 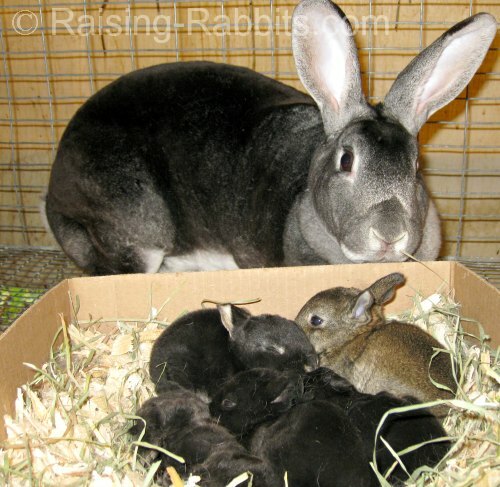 At $9.97, Rabbit Reproduction pays for itself with the very first litter if you save the life of even one single bunny. Click the "add to cart" button, or the Buy Now button below to purchase Rabbit Reproduction today. Upon completing the transaction, you'll immediately receive a download link via email giving you instant access to your e-book. Go ahead - purchase this e-book now and take it for a test drive. Read every page of it if you like. Check out all our tips for feeding orphan kits or convincing does to mate. Study up on false pregnancies or selective breeding. If you aren't completely satisfied that this e-book is worth at least double, triple or even quadruple the price you paid, just drop us a note within 45 days, and we'll refund you the entire cost. That's our Double-Value Guarantee.